I’ve always been a big fan of oatmeal. I remember, when I was a kid, my parents would sometimes make us oatmeal for supper, which they would always serve with warm pieces of toast. I remember spooning my oatmeal right onto my toast, too. I would put a spoonful on a corner and then eat that part. I’d repeat that pattern until my toast had completely disappeared, then I’d grab another toast and start over, until my oatmeal was all gone. That was one supper I really enjoyed. Then, as I grew up, I sort of forgot about oatmeal for a while. Why? I don’t know. Probably because for the longest time, I didn’t do breakfast. There was no time for that… and when I did have breakfast, it would be bacon and eggs. Hmpft… thank goodness people change! I guess I could’ve chosen to have some for supper sometimes, but I just never thought about it. Anywho, now that I have rediscovered the art of breakfast, and the goody goodness of oatmeal, I just love to experiment and create all sorts of different yummy flavors. This one is my latest creation, my favorite so far. Seriously. This has to be the best oatmeal cereal breakfast I have eaten in my entire life. 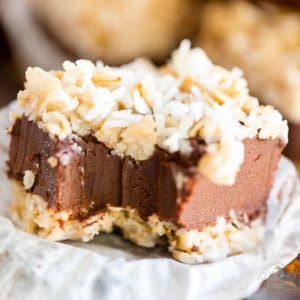 Heck, it’s so good, I think it would even qualify as dessert! While it does require a little bit of prep work and will dirty a few pots and pans, it’s worth all the trouble and more, I swear! 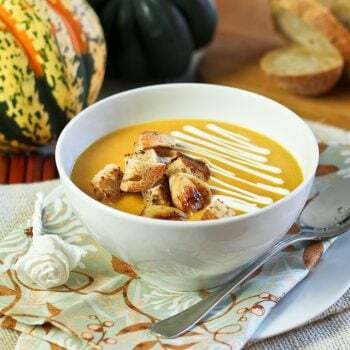 In a small saucepan, bring water and milk to the boil, add salt and oatmeal, lower heat, cover and cook for about 12-15 minutes, stirring often, until all liquid is absorbed and oatmeal is nice and creamy. Meanwhile, in a seperate saucepan, cook blueberries, water, lemon juice, chia seeds and agave nectar over low heat, stirring occasionally, until blueberries start to "explode" and sauce thickens. 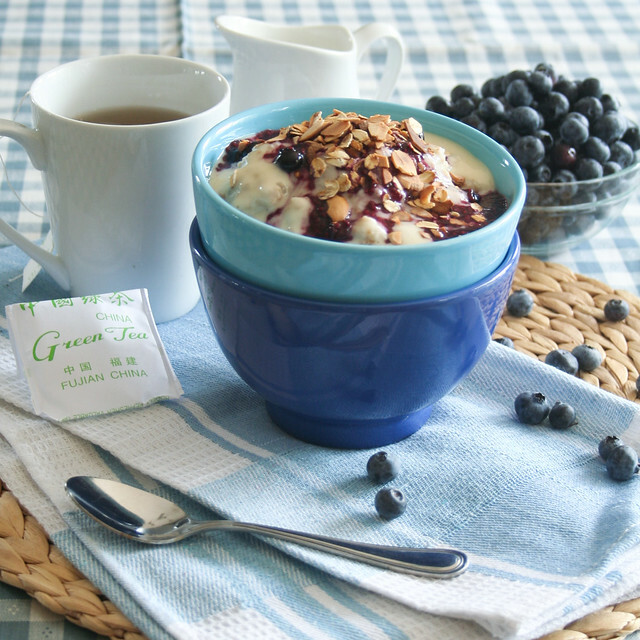 You might want to swoosh the blueberries a little bit with your spoon to help break them up. Set aside when ready. 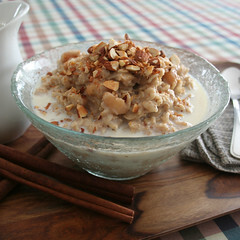 In a small non-stick pan, over medium heat, toast the sliced almonds and old fashion oats until golden and fragrant. Set aside. 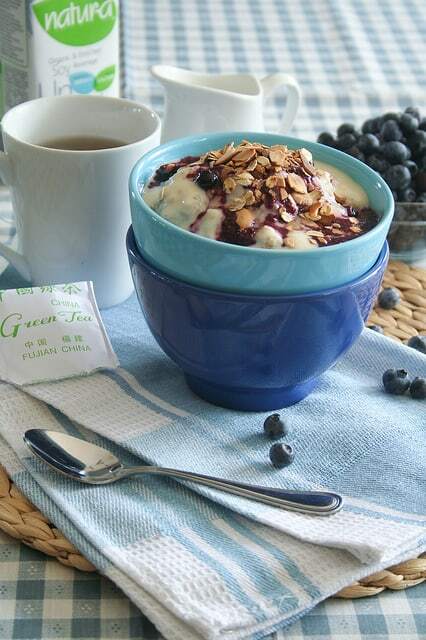 In small mixing bowl, mix protein powder with plain yogurt until smooth and creamy. Set aside. When all your components are ready, transfer to serving bowls, starting with oatmeal, then blueberry sauce, followed by custard and finally the crumble. 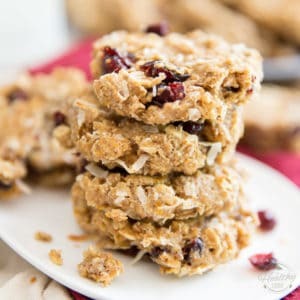 Other oatmeal recipes you might like! 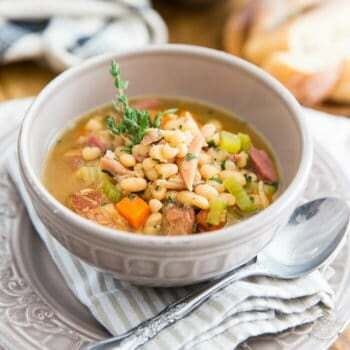 Bring water to the boil, add salt and oatmeal, lower heat, cover and cook for about 10-12 minutes, stirring often, until all liquid is absorbed and oatmeal is nice and creamy. Transfer to serving bowl and add cold milk if desired. 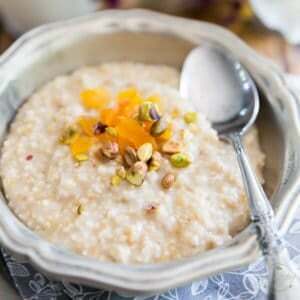 Use a ratio of about 1 part oatmeal to 2 – 2½ parts water. Use more or less water depending on how you like your oatmeal. Adding more water will result in a creamier cereal, less water will give you a stiffer, chewier texture. I like to make mine more on the stiff side and add cold milk after it’s cooked. I really enjoy the contrast between the warm cereal and the cold milk. In a skillet over medium high heat, slightly cook the apple with the cinnamon and four spice, about 2-3 minutes. 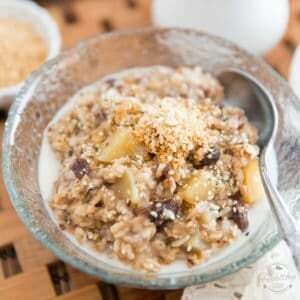 Add the apples to your oatmeal once it’s done cooking, stir to combine and transfer to a serving bowl. TIME SAVING TIP! I like to make large batches of apples and freeze them in individual servings of 100g, which is roughly equivalent to one apple. 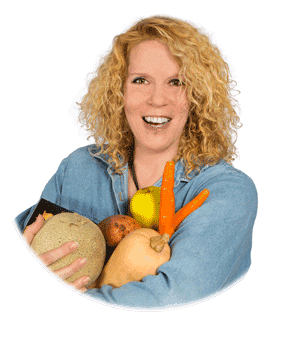 This makes preparing oatmeal or stuffed buckwheat pancakes much easier and quicker! 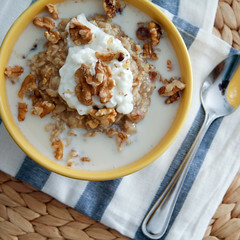 Add the chopped dates to your oatmeal while it is cooking. When it’s done cooking, add the mashed banana, stir to combine and transfer to a serving bowl. A GREAT TRICK is to put your bananas in the freezer when they are getting too ripe to eat fresh. Then when you make something, anything, that requires mashed bananas, be it breads, muffins, smoothies or oatmeal, you just stick one out of the freezer and let it thaw for a few minutes, then the peel comes right off and it’s good to go! 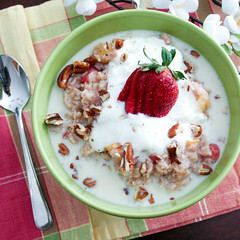 Add fruits to your cooked oatmeal. Stir gently until heated through and transfer to a serving bowl. ANOTHER GREAT FREEZER TRICK is to make little bags of assorted fruits, such as sliced bananas, raspberries, mango cubes, strawberries, blueberries, etc. Mix them all up and make single servings that you bag and keep in your freezer to use in smoothies or cereal. Hey! Love your blog! I’m a 22 yrs old student from Germany! I would also call me food obsessed. Although rather because I don’t get much good food these days as I’m not living with my parents anymore. There’s either no time or I’m too stingy to spend much money on it. Also love your attitude to food (About) and how you changed your life. Motivation is key to everything I guess 🙂 Looking forward to new posts! BEst wishes! Oh my goodness! 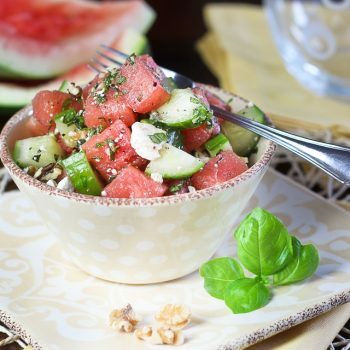 I think your blog has become my new go-to place for new breakfast recipes! ALLRIGHT! That is so good to hear! I am sooooo happy that this oatmeal works for you as well as it does for me! I tell you, I almost feel like I am “cheating” (god I hate that word) big time when I eat that. 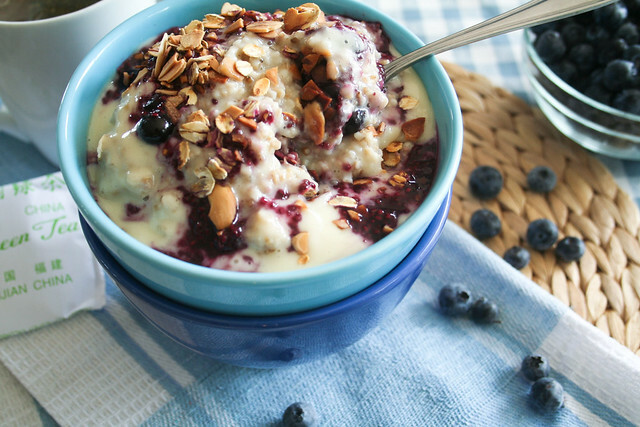 I just made the Blueberry Cobbler Oatmeal and it was fantastic! In the ingredient list for the oatmeal, 1/2 cup of soy milk is listed but then isn’t mentioned in the instructions. I just added it to the water and boiled them together and it turned out great. Was there another use intended for the milk? I saw this recipe featured on The Kitchn, and loved how it was so far removed from the maple syrupy brown sugary oatmeal recipes that are ubiquitous on recipe websites. Plus, it had the word cobbler in it. On top of a gorgeous presentation for Sunday breakfast, this oatmeal tasted fantastic and something I would have expected at a nice brunch restaurant. 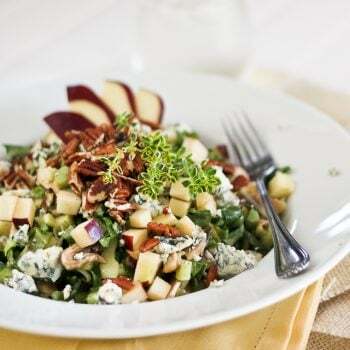 Thanks for the recipe – I will be eating this again soon.